This year I am resolving to make no New Year’s resolutions. I have to get my perfectionism under control before I can make any more of those things. Actually, that’s not entirely true. My New Year’s resolution is this: I want to master the art of baking pie. So once a week I will take a stab at a new pie recipe. I have been wanting to do this for so long. Why not add more to my plate by baking a complex dessert once a week? So I hopped on Amazon and did a little research on good pie books. The very first book that popped up was First Prize Pies: Pies for Every Week of the Year, written by Allison Kave. Call is fate. Call it destiny. Call it a complete contradiction to our family’s goal to eat a little healthier. I hinted that I wanted this book (really, really, really badly) to my doting husband. He bought it, of course, because he can probably count on one hand the amount of times I have really pined over something (out loud anyway). The author of the book was a bartender who won a pie contest in Brooklyn. Her winning launched her into a whole new career. She now owns her own pie shop and is doing very well. 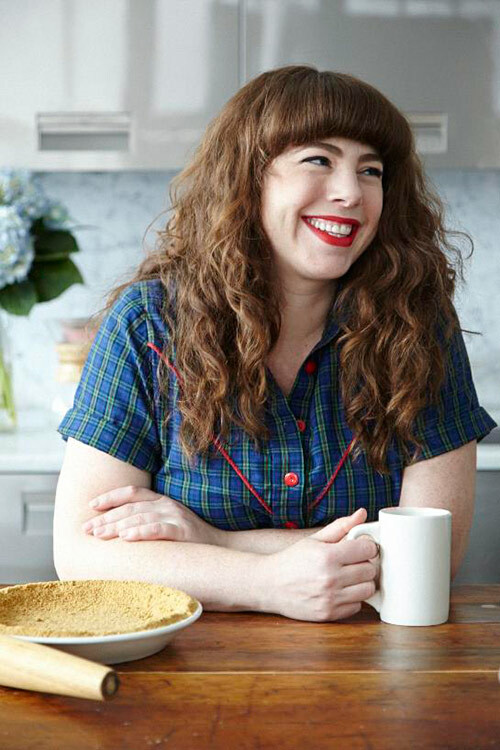 She is a sweet looking rockabilly gal and I cannot even wait to try her recipes. Although, being that she is a bar tender by trade some of her recipes have pricy booze in them that I can’t afford so I may have to supplement other recipes here and there. Here I go, people. This is my year for cavities and perfecting my lousy crust making skills. Yes oh yes, I love apple deserts. Preheat The oven to 425°F. Roll out the dough into a circle about 11 inches in diameter. Transfer it to a 9 inch tart pan or pie plate tuck the overhang under and crimp decoratively. Blind bake the crust until partially baked set aside to cool. Lower the oven to 350°F. In a small sauce pan over high heat, boil the side or until it has reduced down to 3/4 cup, 15 to 20 minutes, let it cool. This step can be done ahead. The reduced cider will keep in an airtight container for up to one week in the fridge or two months in the freezer. In a large bowl, whisk together the eggs, granulated sugar, sour cream, and salt until fully blended. Slowly drizzle in the reduced cider and whisk to fully incorporate. Put the piecrust on a baking sheet. Pour the filling into the crust and bake for 20 to 25 minutes until the filling has just set and is slightly wobbly in the center. Remove the pie to a wire rack to cool completely at least one hour. Make the topping in a stand mixer, with a hand-mixer or by hand with a whisk. Whip the cream with powdered sugar and cinnamon until soft peaks form. 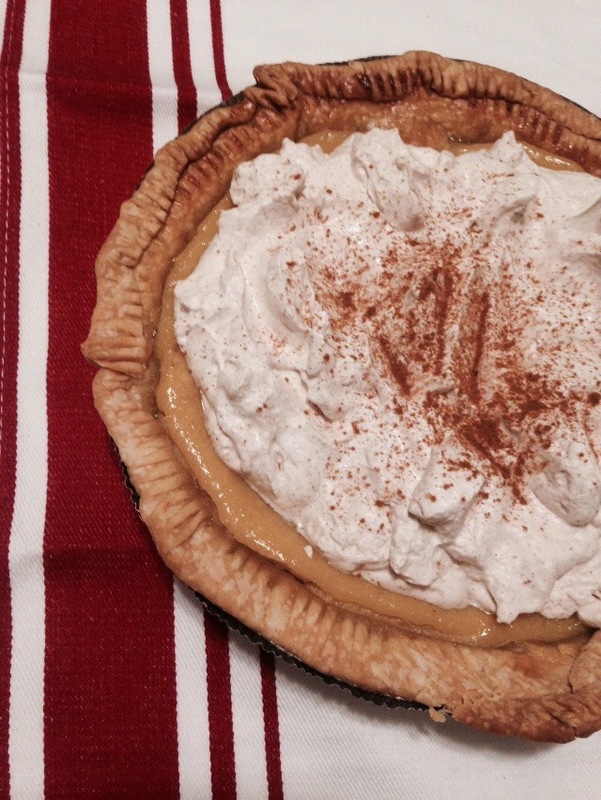 Pile the whip cream on top of the fully cooled pie and serve. This pie can be made ahead without topping and refrigerated up to one week covered in plastic. At the topping just before serving. Prepare the butter and lard (if using). Cut the butter into the 1.2 inch cubes ( a bench scraper is perfect for this, but a sharp knife works well too) and cut the lard into small pieces. Return them to the fridge or freezer to cool. In a liquid measuring cup, stir together the milk and vinegar. Refrigerate the mixture until ready to use. Add the butter and lard (if using) to dry ingredients and , using the tool of your choice, cut the fat into the flour with speed and patience, until the fat has been reduced to small pea sized chunks. Try to use a straight up-and-down motion, avoid twisting the wrists, as the more you press on the flour the more tough gluten will develop in the dough. Avoid using your fingers, as the heat from your hands will melt the fat and further encourage gluten development. Unlike with pasta or bread, gluten is the enemy of pie dough, so be gentle and be quick! Once your fat has been cut down to size, spread your mixture out gently to expose as much surface area as possible. Gently drizzle about half of your milk mixture over the flour , trying to cover as wide an area as you can. Using bench scrapers or a large spoon, toss the flour over the liquid (don’t stir: just lightly toss), spread everything out again, and repeat the process with the second half of the liquid. You should now have a dough that will just hold together when pressed agains the bowl, with visible little chunks of butter. If you need to add more liquid to bind it, do so with more cold milk, adding a tablespoon at a time until you reach the right texture. It’s not an exact science, as everything from the humidity in the air to the dryness of your flour will affect the consistency of your dough. Phew, that was really intimidating. But I can do it. I have actually made pie crusts many times but it only turns out great about 75% of the time. I must master you pie crust! Aaanyways… I made apple cider pie, it was quite toothsome (I hate the word yummy but that’s what it was) and we scarfed it all up. Week one was a success. How about you? New Year’s goals anyone? Comment below, I’d adore to hear from you.